Vienna’s MAK (Museum for Applied Arts) has launched an exhibition of book covers designed by the Wiener Werkstätte. Created between 1904 and 1927, the tomes celebrate the firm’s aesthetic prowess and form a perfect visual panorama of its artistic approach. Founded in 1903 by Josef Hoffman and Koloman Moser, Wiener Werkstätte brought together designers, architects and artists, creating objets d’art that combined ‘good materials and perfect technical execution’. Carl Beitel joined them as in-house bookbinder; the city’s newspaper Wiener Sonn- und Montags-Zeitung wrote about the ‘struggle against the awful, red hard-covers with golden decorations used for our masterpieces’ and the Wiener Werkstätte came to the rescue. 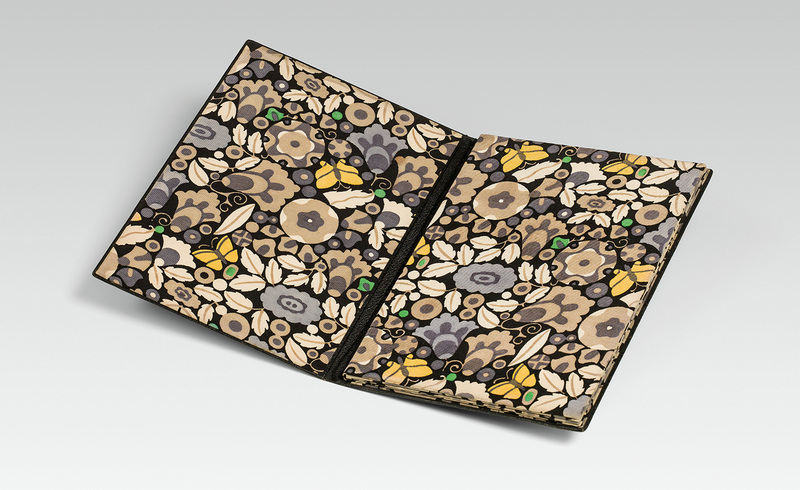 Moser and Hoffman looked at William Morris’ book designs for inspiration, even buying the same leather the English artist – sourced from a Parisian producer – for their creations. Wiener Werkstätte mastered a wide spectrum of techniques, including leather inlaying, embossing, hand-gilding, and leather weaving. Beitel and Moser also developed a series of marbled papers, while fabric and exotic skins and leathers – crocodile, snake, undulate ray, lizard and even frog – were among the materials used for the covers. Early designs were characterised by their stylised, geometric shapes and floral decorations, while later works (post-1918 and after Moser had left the group) had a more playful and opulent aesthetic. The exhibition shows over 70 books from the private collections of Ernst Ploil, guest curator of the exhibition, and Richard Grubman, with additional drawings and approximately 500 leather stamps and select book covers taken from the MAK collection. Some of the book designs reference the contents, such as the Hoffman-designed cover for Alexandre Dumas’ The Three Musketeers (three parallel lines nod to the story), or the cover for Dante Alighieri’s Divine Comedy (1308-1320), commissioned by Max Morgenstein and bearing a gold star design inspired by the poem.